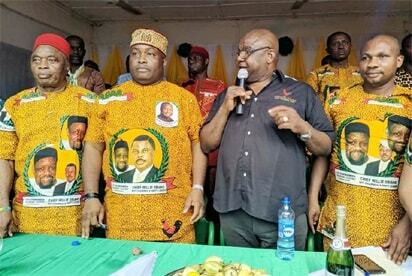 Founder and Chief Promoter of Afa Igbo Efuna Movement, Dr. Patrick Ifeanyi Ubah, Friday, formally declared his intention to contest the Anambra South Senatorial District Election on the platform of All Progressive Grand Alliance (APGA). The Oil Magnate, Dr. Ubah, who paid a courtesy visit earlier today to the party’s state Chairman, Chief Norbert Obi before heading to Orton Palace Hotel Ekwulobia, where the declaration held, assured Ndi-Anambra South, Ndi-Anambra and Nigerians in general that if given the opportunity to represent his people at the Red Chambers, he will put in his best in making quality laws that will benefit both his Senatorial District and Nigerians. Also, while addressing party executives, stakeholders and APGA faithful, Dr. Ubah assured Ndị Anambra South of quality, effective representation and more contributions to the state and national development. The event was well attended by APGA faithfuls, friends of the oil magnate and constituents of the Anambra South Senatorial District.